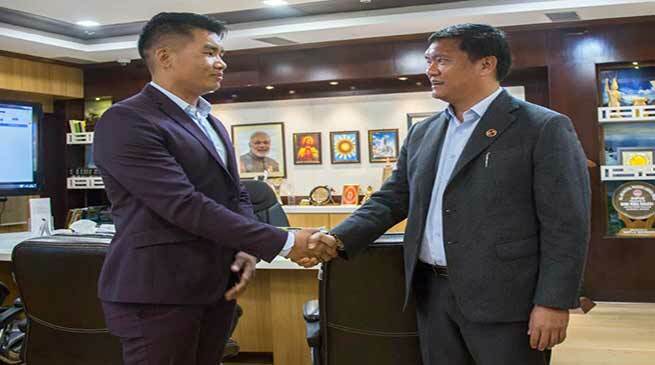 International Karate champion Nobin Jomoh called on Chief Minister Pema Khandu today along with his coach Bulang Marik. Chief Minister expressed happiness in meeting Karate champions and said he was happy to know that Jomoh is the first senior Commonwealth Karate medalist from Northeast held in 2013 at Montreal Canada and an Asian Silver medalist in 2015 at Malaysia. Jomoh, who is currently serving in Arunachal Pradesh Police as Inspector has so far won 5 Gold, 4 silver and 2 bronze medals in various international events and won 19 Gold, 7 silver and 12 bronze medals at the national events. A world Karate qualified coach license holder, he has participated in several world championships held in countries lie Germany, several European countries, Singapore, Malaysia, Indonesia, UAE, Turkey. Chief Minister congratulated Jomoh for his stupendous achievements and assured them of every help in their endeavor towards promoting the sports in Arunachal. He also expressed happiness that Karate players from the state had performed brilliantly in the recently held Northeast Olympic Games in Imphal by bagging 9 Golds and 1 bronze. Chief Minister also conveyed his best wishes to the duo who will be competing at the 2018 Commonwealth Karate Championship to be held in Durban, South Africa on November 28, 2018.